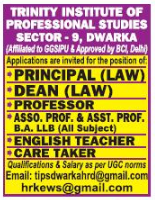 Faculty ON Jobs: Trinity Institute of Professional Studies, Dwarka has advertised in THE HINDUSTAN TIMES newspaper for the recruitment of Teaching Faculty- Professor / Associate Professor / Assistant Professor / Dean / Principal / English Teacher / Care Taker jobs vacancies. Interested and eligible job aspirants are requested to apply as soon as possible from 07th August 2018. Check out further more details below. About College: TIPS, Dwarka is a premium educational institute located at a stone’s throw distance from Sector 10 Metro Station, Dwarka (opposite pillar no. 1160).The Institute has been accredited A+ Grade by SFRC, Govt. of Delhi establishing it as a top notch brand in the field of education. All courses offered by the institute are affiliated to GGSIP University.